Anti-Horoscope: Human "Software" Series, Book 1 · Anti-Horoscope: Human "Software"
For example, did you know that all those people, who were born on January 8th of common years are seemingly sincere with "open souls," meanwhile they have the ability to completely transform? That is, you never know whether a person before you is who he or she is trying to appear as. And so on... Hence the question: are you sure that you know people, whom you think you know as your own self? Yes, of course, you know them, if we take word-play into account. You really do know them, like you know yourself—that is: just as bad! You know your own and other people's masks and roles, but that is all. You do not believe this? Then, open this book and see for yourself! This book is for those people, who are fed up with "horoscopism," who are tired of listening to nonsense about themselves and other people from psychologists or their "all-knowing" relatives, friends and acquaintances. It will help you save not just some time in your life, but your whole life because otherwise you will spend your entire life on something that is a priori impossible. And, it is impossible not because you are idiots, but because Homo sapiens cannot fully know themselves and other people without an external (and, most importantly, objective) source. Perhaps that is the reason why humanity was left "factory instructions" to each one of us—the Catalog of Human Population. Yes, that is right! There exists the Catalog of Human Population, which you can open and find out everything about any person you are interested in (including yourself)! 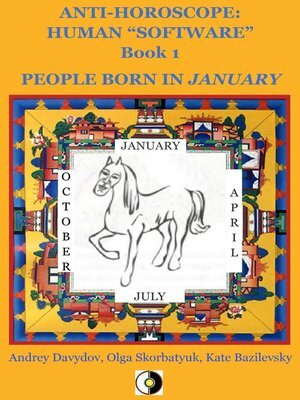 Information about people presented in this book (and in other eleven books in the series titled Anti-Horoscope: Human "Software") is from there, and not from your favorite horoscope.